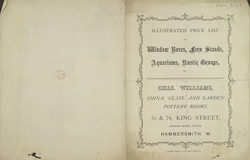 This is an advertisement for Chas William’s china, glass and pottery store in King Street, Hammersmith. In the 19th century bone china started to replace the soft porcelain that had been popular in the 1700s. China started to be mass produced and sold cheaply so that it became the choice for crockery for all classes, the cost of each piece varying depending on the type of decoration and design. Wealthy families would have had large sets of dinner services for the extravagant dinner parties that they held.